Ok, these may not be the healthiest-but they sure are GOODt!!! 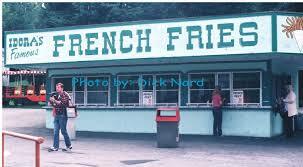 If you were lucky enough to have been a part of the Idora Park experience in Youngstown, Ohio, then you may just have had the best french fries on the planet! These fries were so infamous, that visitors like my family would drive up to the back gate, give the password to the ticket agent 'Idora Fries Please' and dart in and out to get our fix of Idora Park Fries! Or, if you were really daring, you snuck in via the Mill Creek Park Secret Entrance "Been there, done that." This recipe is sure to take you back to a simpler time when there was the Wild Cat, The Historic Merry-Go-Round, The trip through the Kooky Castle, The Jack Rabbit, Laffin Lena's (fun house), and the Helter Skelter bumper cars, played in Kiddie land or danced at the Idora Park Ballroom. Idora Park closed September, 16 1984. Then, a high-school sophomore, sneaking in the back gate to get french fries during my yearly trip back home to the YO was officially a memory, lost to time, fires, vandals, lost hopes and plans. If you want a bit of that Idora Park nostalgia try this recipe, close your eyes and smell the memories. Cook in a convection oven on 450 for 10-15 minutes-just long enough for the shell to be hard, but the insides nice and mushy (if you have a conventional oven, you may need to double cooking time...but the crispness comes from the convection wave, so you may want to invest in a small counter-top convection oven. I bought mine from BigLots orWalmart). Remove once desired crispness is reached and season with salt to taste. Sprinkle on the ACVinegar . This is the essential part to get all the goodness to just the right parts of the fry for consumption and true memories to erupt.